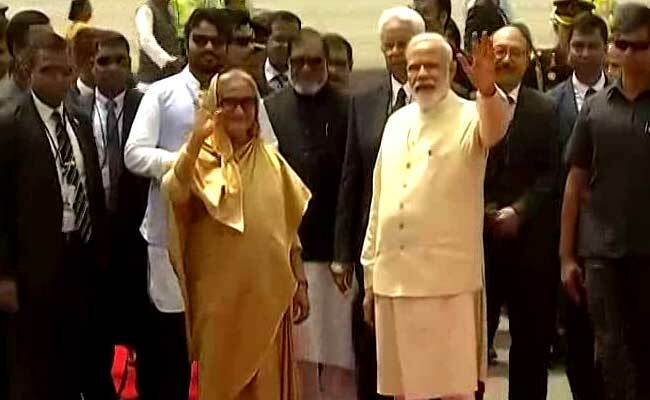 New Delhi: Setting aside protocol, Prime Minister Narendra Modi today went to the Indira Gandhi International airport in Delhi to receive his Bangladeshi counterpart Sheikh Hasina, who is in India on a four-day visit. The two leaders will hold bilateral talks in New Delhi. To experience what regular commuters do everyday, Prime Minister Modi travelled through normal traffic without any route restrictions, official sources said. The Bangladesh Prime Minister's visit comes after a gap of seven years. Prime Minister Hasina will hold wide-ranging talks with PM Modi tomorrow during which India is expected to announce a line of credit of US $500 million to Bangladesh for military supplies. The two sides are expected to sign at least 25 pacts in various key sectors including civil nuclear cooperation and defence, however, it is unlikely that there will be any agreement on the Teesta water sharing issue during this visit. "The visit is expected to further expand the cordial and cooperative relationship between India and Bangladesh and build on the strong ties of friendship and trust between the two leaders," a joint statement issued earlier by the two countries said. Sheikh Hasina will also call on President Pranab Mukherjee and meet opposition leader Sonia Gandhi. She will visit Ajmer on Sunday and will meet Indian business leaders on Monday. She will also join a function at Manekshaw Centre to honour Indian Armed Forces members who embraced martyrdom in Bangladesh's War of Liberation in 1971. Diplomatic quarters of both sides believe that the reciprocal visit of Bangladesh's Prime Minister would take the Dhaka-New Delhi "historic relations" to new heights, unveiling newer dimensions of cooperation in various sectors including trade and commerce, economy and connectivity. It will be Sheikh Hasina's first bilateral visit to India in her current term as prime minister. Ramping up cooperation in defence and security will be a major focus area of the talks between PM Modi and Prime Minister Hasina and apart from an MoU to provide US $500 million credit, another pact is likely to be signed to formalise regular defence engagements. Issues like combating terrorism, containing radicalism and enhancing security cooperation between the two countries are likely to figure prominently. Liberation War Affairs minister AKM Mozammel Haque, Water Resources Minister Anisul Islam Mahmud, Law Minister Anisul Haque, Foreign Minister AH Mahmood Ali, the Premier's Economic Affairs Advisor Moshiour Rahman and State Minister for Foreign Affairs Shahriar Alam are accompanying Prime Minister Hasina for the visit.